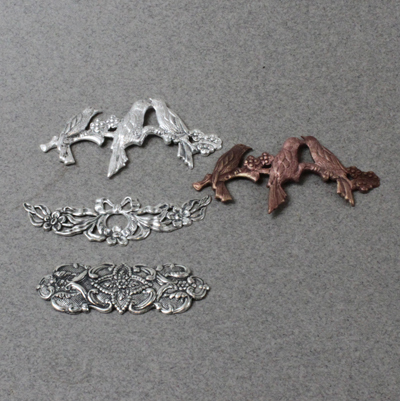 I found the three birds on a branch stamping to be a great candidate for a ring. 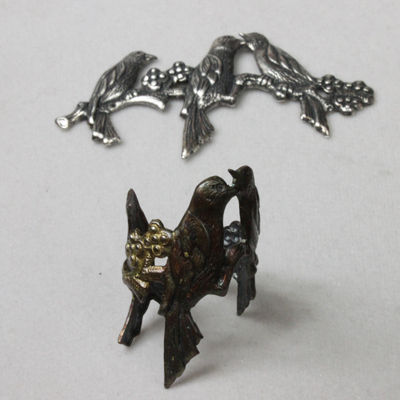 In silverplate it looked fine but the birds resemble black birds and I wanted to add a patina that would match nature’s plumage. First polish, then clean and degrease any stampings or metal pieces to be treated. 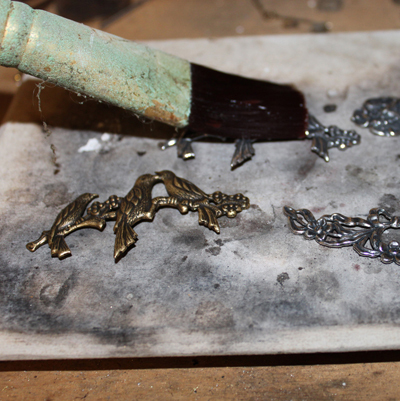 Apply the flux to the surface of the metal with a brush or dip the stamping in the flux. 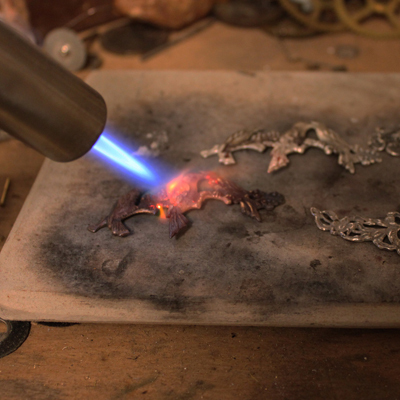 Set it on the soldering pad and heat with the torch until the flux turns white and the metal begins to show color. Allow the metal to cool without quenching. This does two things first softening the metal to make it easy to bend or manipulate. Second it opens the metal to better accept the patina. Place the cooled stamping in the pickle. If you heat the pickle in a crock pot or hot pot to 140 degrees the pickle will remove the flux quickly. If you don’t want to use it warm allow the item to sit for an hour until all the flux is dissolved and silver will show white. Brass and copper will be coppery colored at this stage. Remove the item from the pickle with the copper tongs and rinse in cool water. 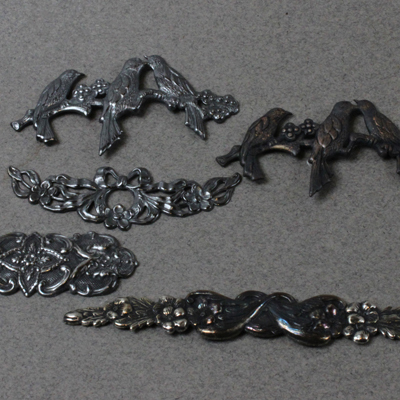 Dry the metal and prepare the Patina Gel and water mix. 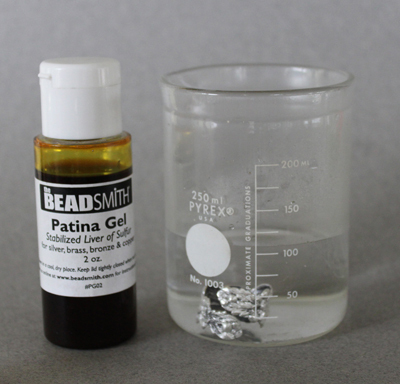 I use 8 drops of Patina gel in 1/3 cup or 50ml of very hot 140+ degree water. Heat the item in hot water then place it in the mix. Allow it to change color. For a light pewter look a few seconds will be enough. For a deep gunmetal color a few minutes will be needed. For the iridescent green purple I removed the piece from the mix and rinsed in hot water then returned it to the mix repeating until the desired color was achieved. To selectively treat part of a piece you can brush the hot mix directly on where you wish to color. Make a paste of baking soda and water in your palm and gently rub the mixture over the high points to give a little highlight to the patina. Wash and dry the metal and you are finished. 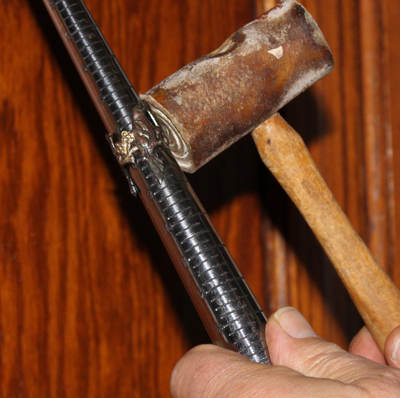 To bend the stamping into a ring hold the stamping against a mandrel and gently tap it with a rawhide or plastic mallet. When it wraps around the mandrel completely reverse it and even out the bends. Harry W Wood earned a BA in fine art then apprenticed as a goldsmith and jewelry repairman working 8 years in a corporate shop. 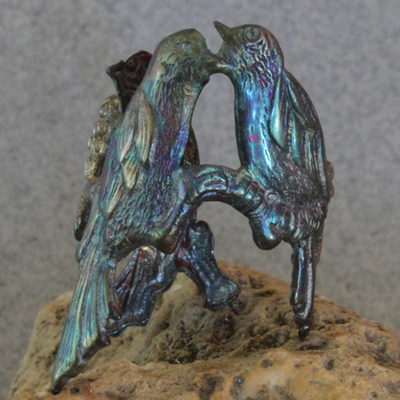 After 30 years creating and displaying sculptures, photos, and paintings in juried exhibitions I returned to jewelry design and opened Oscarcrow at etsy.com. I try to learn something new every day and create at least one new object each day.